"Pharmaceutical advertisements is one of the important methods of spreading the information about drugs to the concern Physician or Prescribers". , Besides personalized visits by designated representatives, various other methods are also used to spread the awareness about the drug and advertisements in medical journals. Ethically, the advertisement should contain valid information and sufficient literature support about the claims made in support of drug, as these advertisements can affect the prescribing behavior of physicians. , Ethical guidelines for drug promotional activities are set both at national and international level. ,, At international level, two important guidelines for regulation of drug promotional activities are "Ethical criteria for medicinal drug promotion" by "World Health Organization (WHO)" and "Code of Pharmaceutical Marketing Practices" by "International Federation of Pharmaceutical Manufacturers Associations (IFPMA)." , In India, drug promotional activities are largely governed by "Organization of Pharmaceutical Producers of India (OPPI)." Despite guidelines for drug advertisements being in place, insufficient information about the drug and literature quoted to support the claim made in the advertisements have been documented in international journals. Very few studies on issue of ethical concerns regarding advertisements published in medical journals have been done in India. In 1997, Gitanjali et al. conducted a study on drug advertisements published in Indian edition of British Medical Journal (BMJ) and observed that many components of ethical advertisements like generic names, price, and postal address of manufacturers were not adequately reported. Few studies were also done to document ethical issues related to drug promotional literature distributed by pharmaceutical companies to drug prescribers. , Present study is an attempt to study rationality of drug advertisements published in various Indian Medical Journals. Present study included all medical journals related to clinical practice subscribed by the Central Library of Government Medical College, Surat. These Journals included Indian Journal of Pediatrics (IJP), Indian Pediatrics (IP), Journal of the Association of Physicians of India (JAPI), Journal of Indian Medical Association (JIMA), Indian Journal of Critical Care Medicine (IJCCM), Indian Journal of Medical and Pediatric Oncology (IJMPO), Indian Journal of Gastroenterology (IJG), Indian Journal of Ophthalmology (IJO), and Journal of Obstetrics and Gynecology of India (JOGI). Hence, a total of nine journals were included in the present study. Random selection of three issues of each of the nine journals published in the year 2009-2010 was done. Hence, a total of 27 issues were evaluated for rationality of the drug advertisement. The criteria of evaluation were based on the WHO criteria for rationality of the drug advertisement. WHO criteria for drug advertisements published in medical journals includes evaluation of information related to generic name of the drug, indication, dosage, precaution, contraindication, adverse effect, price, postal address of pharmaceutical company, and reference to scientific literature. Each author evaluated drug advertisements published in these medical journals independently on the basis of WHO criteria, and two-stage Delphi was used to come to a common consensus. Numbers of claims and references made in each advertisement were also evaluated. Cited references were searched in various search engines like Pubmed, Ind med, and Google search. References then were classified as journal article, generic data on file, specific data on file, meeting abstract or presentation, book or monograph, marketing report, prescribing information, government documents, etc. Journal articles were further classified as original research, review, meta-analysis, guideline of position statement, editorials or comments, case reports, letter, etc. Inclusion criteria included advertisements published in journals between 2009 and 2010, whereas the advertisements on devices and nutritional supplements were excluded, keeping in view of the operational feasibility. Descriptive statistics was used for statistical analysis. All values were expressed as frequencies, percentages, and 95% confidence interval (CI) around the percentages. Because of duplication of same advertisements in different journals, a total of 107 drug advertisements were included for evaluation as per the WHO guidelines. Of 107 advertisements evaluated, 76 (72.3%; 95% CI, 63.1% to 80%) were related to single drug and rest 31 (29.5%; 95% CI, 21.6% to 38.8%) were of drug combinations. 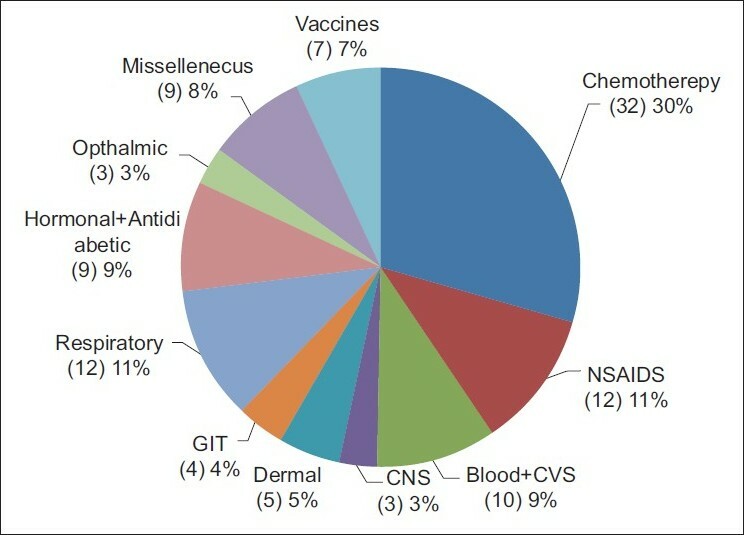 Majority of the advertisements were related to chemotherapy (30%) [Figure 1]. As per the WHO-based evaluation criteria, Brand name was mentioned in all advertisements and generic name was also mentioned in 90% advertisements. Indications of the drug or drug combination were mentioned in 84% advertisements. Appropriate dose for the drug was mentioned in 24% advertisements. Instructions regarding precautions and contraindications were mentioned in 17% and 16%, respectively. Adverse effects following consumption of the drug was mentioned in only 19% of the advertisements. On the major, issue of drug pricing was largely found missing in the advertisements and only 5% of the advertisements displayed pricing. Address of pharmaceutical company was mentioned in 74% advertisements [Table 1]. It was observed that of 264 claims made in these 107 drug advertisements (2.4 per advertisement), only 74 (28%; 95% CI, 22.9% to 33.7%) claims were supported with appropriate references. A total of 86 references were cited in support of these 74 claims. Of these 86 references, seven references were not cited properly. 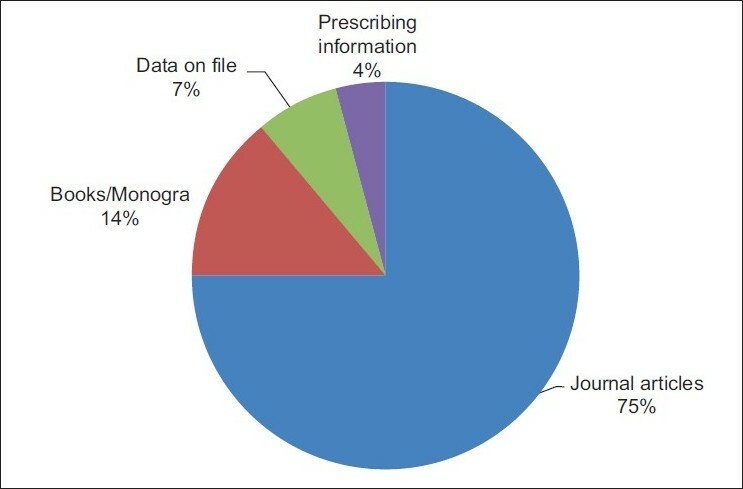 Hence, of the remaining 79 references, 59 were journal articles, 11 were books or monographs, six were data on file, and three were prescribing information [Figure 2]. 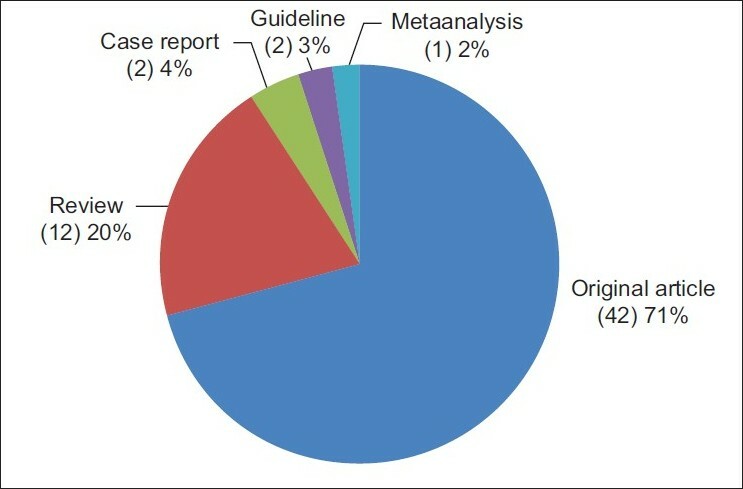 Of the 59 journal articles cited in support, 42 were original articles, 12 were reviews, two were case reports, two were guidelines, and one was meta-analysis [Figure 3]. References when searched in an appropriate search engine, only 53 (61.6%) out of 86 references were available on Pubmed and Google. Present study was an attempt to evaluate the drug advertisements published in various Indian Medical Journals and after evaluation against a standard evaluation tool, serious ethical issues surfed out. Very vital information regarding precautions, contraindications, adverse effects, and price were not mentioned in many advertisements. Very few claims as published in the advertisements were supported by appropriate references. It was observed that WHO criterion of ethical reporting of drug promotional material is not followed in majority of the published advertisements. This inadequacy may create confusion and biases in the mind of physician during making decisions regarding rational prescribing of drugs. Hence, it can be concluded that majority of the advertisements that are published in Medical Journals are not to spread awareness and help rational prescribing, but to promote the drugs. It is a matter of serious concern as ethical issues related to drug advertisements are largely overlooked. In this study, it is found that only 28% claims were supported by references; this is very less as compared with western studies, but similar to the studies done in developing countries. Types of references observed in this study were also similar to other studies done for western and Indian journals. So, findings of this study are more or less similar to other studies including the few Indian studies done in 90s. This shows that still very less progress is observed in the quality of drug advertisements despite various efforts being done at national and international level and it should be a matter of concern. For rational prescribing, a physician should know not only about the effect of drug, but also about the harm, so that decision for prescribing can be taken after understanding probability of effect and harm, but most of the advertisements were lacking information on adverse effect, contraindications, and precautions. On the basis of this study, it can be suggested that physician should not totally rely on these advertisements for prescribing information and other parallel sources should also be used. Physicians and official bodies of physicians should promote the ethical advertisements and complain should be lodged to official authorities for unethical advertisements. In India, some regional ethics committees are formulated where these complains can be submitted. It is also a duty of Journal editors to make a policy on ethical advertisements in their journal. 1. Levy R. The role and value of pharmaceutical marketing. Arch Fam Med 1994;3:327-32. 2. Wind Y. Pharmaceutical advertising. A business school perspective. Arch Fam Med 1994;3:321-3. 3. Lexchin J. Physicians and drug companies interact. Can Fam Physician 1993;39:1881-2. 4. Wolfe S. Drug advertisements that go straight to the hippocampus. Lancet 1996;348:632. 5. Walton H. Ad recognition and prescribing by physicians. J Advert Res 1980;20:39-48. 6. World Health Organization. Ethical criteria for medical drug promotion. Available from: http://www.who.int/medicinedocs. [Last cited on 2010, Dec 2]. 7. International Federation of Pharmaceutical Manufacturers Associations (IFPMA). Code of Pharmaceutical Marketing. Available from: http://www.ifpma.org/pdf/IFPMA-TheCode-FinalVersion-30May2006-EN.pdf. [Last cited on 2010, Dec 2]. 9. Othman N, Vitry A, Roughead EE. Quality of Pharmaceutical Advertisements in Medical Journals: A Systematic Review. PLoS One 2009;4:e6350. 10. Gitanjali B, Shashindran CH, Tripathi KD, Sethuraman KR. Are drug advertisements in Indian edition? BMJ unethical? Br Med J 1997;315:459-60. 11. Mali SN, Dudhgaonkar S, Bachewar NP. Evaluation of rationality of promotional drug literature using World Health Organization guidelines. Indian J Pharmacol 2010;42:267-72. 12. Lal A. Information contents of drug advertisements: An Indian experience. Ann Pharmacother 1998;32:1234-8. 13. Carandang ED, Moulds RF. Pharmaceutical Advertisements in Australian Medical Publications - Have They Improved. Med J Aust 1994;161:671-2. 14. Chirac P, Pikon A, Poinsignon Y, Vitry A. Drug Marketing in French-Speaking African Countries. Soc Sci Med 1993;36:1541-3. 15. Vlassov V, Mansfield P, Lexchin J, Vlassova A. Do drug advertisements in Russian medical journals provide essential information for safe prescribing? West J Med 2001;174:391-4. 16. Herxheimer A, Lundborg CS, Westerholm B. Advertisements for Medicines in Leading Medical Journals in 18 Countries: A 12-Month Survey of Information-Content and Standards. Int J Health Serv 1993;23:161-72. 17. Lal A, Moharana AK, Srivastava S. Comparative evaluation of drug advertisements in Indian, British and American medical journals. J Indian Med Assoc 1997;95:19-20. 18. Lal A, Sharma ML. Drug advertisements in Indian medical journals. Indian J Physiol Pharmacol 1992;36:139-40. 19. Islam SM, Farah SS. Sources of information in drug advertisements: Evidence from the drug indexing journal of Bangladesh. Indian J Med Ethics 2008;5:136-7. Zetterqvist, A.V. and Mulinari, S.
Charan, J. and Mulla, S. and Ryavanki, S. and Kantharia, N.